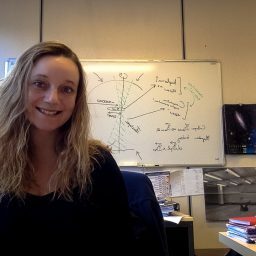 Anaëlle Maury (AIM/CEA-Saclay), "Characterizing the formation mechanisms of protostellar disks: observations and models"
Understanding the first steps in the formation of stars and protoplanetary disks is a great unsolved problem of modern astrophysics. Observationally, the key to constraining theoretical models lies in high-resolution studies of the youngest protostars. I will present our observations and modeling of the millimeter dust continuum emission in a sample of young protostars, and discuss our findings that most young protostellar disks (>75%) are only found at very small radii <60 au, which favors magnetized models for protostellar disk formation. I will also present our ALMA observations of the molecular line emission in a very young solar-type protostar suggesting a disk is currently forming in counter-rotation with respect to the protostellar core rotation, and discuss potential scenarii to understand this oddity. Finally, I will show our SMA and ALMA observations of the magnetic field topology in a sample of young protostars. I will conclude by comparing all observed properties of the youngest protostars to the typical outcome of models for protostellar formation. I will argue that our observations of small disks, counter-rotating disks and organized magnetic fields in the youngest star-forming cores question the established paradigm of disk formation as a simple consequence of angular momentum conservation during the main accretion phase: they instead highlight the need to investigate magnetized models in order to unveil the mechanisms responsible for protostellar disk properties.